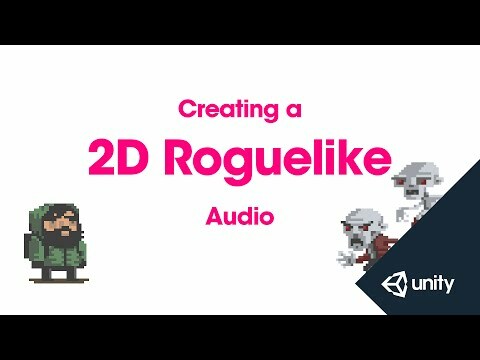 This is part 13 of 14 of the 2D Roguelike tutorial in which we add the music, sound effects and scripting to control our sound effects. and music to our game. from a single game object, our Sound Manager. and we'll label this SoundManager. we're going to add 2 audio sources to it. the second is going to loop our background music. And again select Audio source. to control when our sounds are going to play. and we'll label that SoundManager. called instance and set it to equal null. random variation to the pitch of our sound effects. We're going to initialise these with the values 0.95 and 1.05. 5% of our original pitch. variations in pitch that will be distracting. that we used for our Game Manager. equals null and if not we're going to set it to this. we're going to destroy this game object. to play single audio clips. PlaySingle is going to take a parameter of the type audioClip. that are executing the actual game logic. our sound effects and our music loop. the clip of efxSource to the clip that we parsed in as a parameter. Next we're going to play the clip in efxSource. that returns void called RandomizeSfx. RandomizeSfx takes an array of audio clips as a parameter. To do this we're going to use the params keyword. of the same type, as specified by the parameter. as long as we separate each one with a comma. the length of our clips array. to choose a random clip from the array to play. to our randomIndex choice from our array clips. Then we're going to play the clip. alternate clips randomly and by randomizing the pitch a little bit. again and again and again from sounding to repetitive and annoying. because we're not going to need it. And then let's save our script and return to the editor. our SoundManager script to our SoundManager game object. and we're going to setup our component references. to our Efx Source slot. And our second to our Music Source. to our second audio source. We'll use the asset picker. Choose the audio clip scavengers_music. so that the music will loop. for our first audio source for the sound effects. Let's give that a test. moves around and takes actions. Let's open the Player script in Monodevelop. including 2 variations of each sound effect. is going to be in AttemptMove. that we're using to select our clips randomly from. when we pick up our food or soda objects. Let's save our Player script and return to the editor. the sound effects for the player. and we're going to select Scavengers_footstep1. For Eat Sound 1 we're going to select Scavengers_Fruit1. For Eat Sound 2 we're going to select Scavengers_Fruit2. Drink Sound 1 is going to be Scavengers_Soda1. Drink Sound 2 will be Scavengers_Soda2. And Game Over Sound will be Scavengers Die. the needed code to play our sound effects to our Enemys script. Click on Enemy in our Scripts folders, double click to open in Monodevelop. two public variables called enemy attack 1 and 2.
we're going to play when the enemy attacks the player. to play the enemyAttack sound effect. Let's save that and return to the editor. our sounds to our wall. and open our Wall script. called chopSounds 1 and 2. Let's add our chopSounds to our Wall prefabs. Shift-click to select them all. And now let's give it a test. swipe controls to the game. We'll do this in the next and final video. public AudioSource efxSource;                   //Drag a reference to the audio source which will play the sound effects. public AudioSource musicSource;                 //Drag a reference to the audio source which will play the music. public static SoundManager instance = null;     //Allows other scripts to call functions from SoundManager. public float lowPitchRange = .95f;              //The lowest a sound effect will be randomly pitched. public float highPitchRange = 1.05f;            //The highest a sound effect will be randomly pitched. //if not, set it to this. //Destroy this, this enforces our singleton pattern so there can only be one instance of SoundManager. //Set SoundManager to DontDestroyOnLoad so that it won't be destroyed when reloading our scene. //Used to play single sound clips. //Set the clip of our efxSource audio source to the clip passed in as a parameter. //RandomizeSfx chooses randomly between various audio clips and slightly changes their pitch. //Generate a random number between 0 and the length of our array of clips passed in. //Choose a random pitch to play back our clip at between our high and low pitch ranges. //Set the pitch of the audio source to the randomly chosen pitch. //Set the clip to the clip at our randomly chosen index.